The inaugural YNOT Cam Awards happened last week in Hollywood, CA. Held at the world-famous Avalon Theatre, between the red carpet – so hot that it literally caused a car accident — fancy dinner, stellar entertainment and heart-warming winnings, it was a super night for the #cammunity overall. Amidst all that, models from Studio20 Los Angeles turned out for the event. For many of the models, the YNOT Cam Awards was the first local cam awards event they got to attend. And according to representatives from Studio20, some of the ladies had – understandable – butterflies. Two of the Studio20 Los Angeles models, Kory Blu and Analise Yoel, were nominated for awards that night! 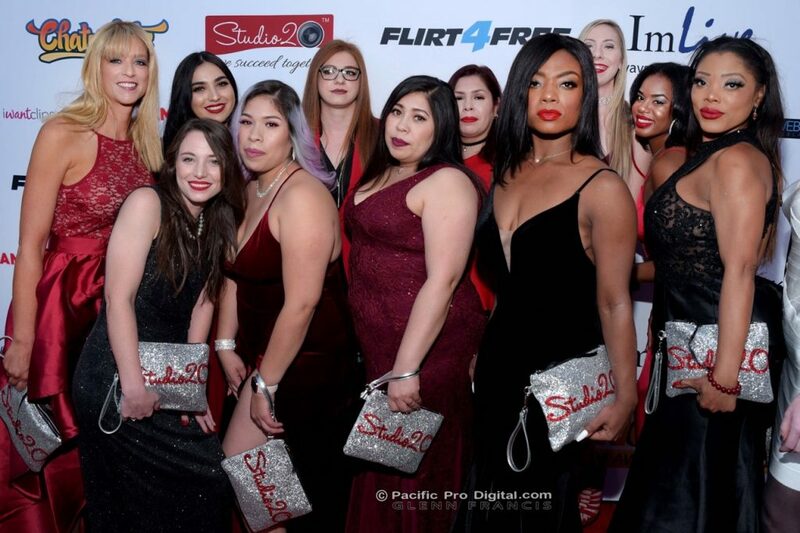 A large group of Studio20 models were in attendance, all arriving together in a stretched white limo with the Studio20 logo emblazoned along the side, each sporting a custom-made Studio20 handbag. “We wanted to give the girls a gift for all the hard work they did, and we though that the best thing was a really nice clutch… We had them custom made and sent them over the day before the event,” Studio 20’s PR executive Andra Chirnogeanu explained. Kory Blu won the award for Best Fetish Cam Star, her first professional accolade. The @YNOT_Cam Awards were totally fabulous! Truly amazing evening. So happy to win Best Fetish Cam Star!! Thank you! Analise Yoel won the award for Emerging Cam Star (North America), which she accepted to the tune of wild cheering and applauses from her colleagues and event attendees. “This award means so much to me, as well as being recognized among my peers. The whole award show was a great experience, and I’m already thinking of the next award shows and ways to show my fans and members my gratitude,” Yoel said. The award for Best Personal Model Site was won by Studio20 veteran and businesswoman, Devious Angel. Angel and her colleague Raquelle Diva are the co-owners of Studio20’s Double D studio in Bucharest, Romania. Unfortunately, Angel was not present to accept her award, but her Los Angeles squad was there at her behest. “When you say #girlsfromstudio20, you say ‘glamour,’ you say ‘style’ and ‘classy.’ Our style is not about showing off but being classic and unforgettable. Hollywood just got some glam back,” Chirnogeanu said. For the full list of YNOT Cam Awards winners, go here.